The autoinducer-2 (AI-2) group of signalling molecules are produced by both Gram positive and Gram negative bacteria as the by-product of a metabolic transformation carried out by the LuxS enzyme. They are the only non species-specific quorum sensing compounds presently known in bacteria. The luxS gene coding for the AI-2 synthase enzyme was found in many important pathogens. Here, we surveyed its occurrence in a collection of 165 marine isolates belonging to abundant marine phyla using conserved degenerated PCR primers and sequencing of selected positive bands to determine if the presence of the luxS gene is phylogenetically conserved or dependent on the habitat. The luxS gene was not present in any of the Alphaproteobacteria (n = 71) and Bacteroidetes strains (n = 29) tested; by contrast, these bacteria harboured the sahH gene, coding for an alternative enzyme for the detoxification of S-adenosylhomocysteine (SAH) in the activated methyl cycle. Within the Gammaproteobacteria (n = 76), luxS was found in all Shewanella, Vibrio and Alteromonas isolates and some Pseudoalteromonas and Halomonas species, while sahH was detected in Psychrobacter strains. A number of Gammaproteobacteria (n = 27) appeared to have neither the luxS nor the sahH gene. We then studied the production of AI-2 in the genus Shewanella using the Vibrio harveyi bioassay. All ten species of Shewanella tested produced a pronounced peak of AI-2 towards the end of the exponential growth phase in several media investigated. The maximum of AI-2 activity was different in each Shewanella species, ranging from 4% to 46% of the positive control. The data are consistent with those of fully sequenced bacterial genomes and show that the potential for lu xS related signalling is dependent on phylogenetic affiliation rather than ecological niche and is largest in certain groups of Gammaproteobacteria in the marine environment. This is the first report on AI-2 production in Shewanella species; its signalling role in these organisms remains to be elucidated. Cell to cell communication – also called quorum sensing – by self-produced small signalling molecules (autoinducers) is a mechanism by which bacteria coordinate gene expression within their population and in such a way obtain optimum timing and efficiency, for example when infecting a eukaryotic host, degrading polymers, or colonizing surfaces. While most quorum sensing mechanisms studied to date are species specific, Bassler et al. discovered an autoinducer in the marine pathogen Vibrio harveyi which is the byproduct of a reaction carried out by a metabolic enzyme and thus has the potential to act as a universal bacterial signal. Autoinducer-2 (AI-2) refers to a group of compounds resulting from spontaneous cyclisation and hydration of dihydroxypentanedione (DPD), which yields (2S,4S)-2-methyl-2,3,3,4-tetrahydroxytetrahydrofuran (S-THMF) and (2R,4S)-2-methyl-2,3,3,4-tetrahydroxytetrahydrofuran (R-THMF) in chemical equilibrium. S-THMF spontaneously reacts with borate ions to form the active compound detected by V. harveyi , while R-THMF, the other stereoisomere, is unable to complex borate and is sensed by Salmonella typhimurium  and probably by Escherichia coli , but not by V. harveyi. The receptor proteins for S-THMF and R-THMF are not homologous, and their three dimensional structures determine the specificity of their interaction with the respective signalling molecules [2, 3]. DPD is produced only in the domain Bacteria as a by-product of the activated methyl cycle. The pathway leading to DPD involves a two-step detoxification of S-adenosylhomocysteine (SAH), namely by a MTA/SAH nucleosidase (also called Pfs enzyme) and a S-ribosylhomocysteinase. The latter enzyme is also known as LuxS enzyme or AI-2 synthase. The products of the reaction carried out by the LuxS enzyme are homocysteine and DPD, which spontaneously forms the AI-2 group of compounds. However, all Eukarya, Archaea, and some phyla within the domain Bacteria employ an alternative one-step detoxification of SAH using only a SAH hydrolase (SahH) enzyme. These bacteria are therefore unable to produce AI-2 [5, 6]. The presence of the luxS gene (two step detoxification of SAH leading to AI-2) versus the sahH gene (one step detoxification) was previously surveyed in the genomes of fully sequenced bacteria [6, 7]. Thus, the luxS gene was found in some Gamma- and Betaproteobacteria, all Epsilonproteobacteria, none of the Alphaproteobacteria, none of the Actinobacteria, all Firmicutes and some Spirochaetes. Since the majority of the fully sequenced bacteria at the time were pathogens, and the number of genomes within the various phylogenetic groups was sometimes very small, it had to remain open if the presence of the luxS gene is phylogenetically conserved or if it has been acquired through lateral gene transfer by pathogens. In the sea, the three most abundant groups of heterotrophic bacteria are members of the Alphaproteobacteria, Gammaproteobacteria, and Bacteroidetes [8–10]. Therefore, here we studied a collection of 165 marine isolates from these three phylogenetic groups [11, 12] for the presence of the luxS gene using PCR amplification with conserved degenerated primers and sequencing of selected bands. Since the absence of the luxS gene could theoretically be due to lack of primer specificity, we confirmed our results by determining the presence of the sahH gene, representing the alternative pathway for SAH detoxification. Most bacteria have either the luxS or the sahH gene in monocopy. There are several exceptions, e.g. Escherichia blattae carries both genes, and some bacteria have neither luxS nor sahH [6, 7]. Within the Gammaproteobacteria, the luxS gene was detected in all Shewanella strains consistently. The genus Shewanella was first described in 1985  and includes organisms that have been associated with spoilage of proteinacous food (S. putrefaciens) as well as opportunistic human pathogens (S. algae) [14, 15]. During the past two decades, members of the genus Shewanella have mostly been studied for their involvement in anaerobic transformations important for biogeochemical cycling of elements. The coupling of growth and energy generation to the dissimilatory reduction of iron and manganese oxide have been demonstrated in S. oneidensis MR-1 for the first time in 1988 [16–18]. Although the luxS gene has been found in S. oneidensis and in several draft genomes of Shewanella strains which are currently sequenced, AI-2 production has not yet been investigated in this genus, which comprises both pathogenic and free living species. Therefore, here we determined the ability of nine Shewanella type strains and one new marine Shewanella isolate to stimulate luminescence of the AI-2 biosensor strain V. harveyi BB170 and indeed confirmed the production of AI-2 in all of them for the first time. In this study, 148 strains were investigated which have been isolated from various habitats of the North Sea near the island of Helgoland, e.g. the surface of microoalgae (diatoms, dinoflagellates) and macroalgae (laminaria), suspended particles, in situ grown biofilms, and the picoplankton [11, 19]. In addition, 8 strains from the hypersaline Antarctic Ekho Lake were also included . The marine isolates were identified on the basis of near complete 16S rRNA gene sequences and belonged to 3 different phylogenetic groups: Alphaproteobacteria (71 isolates), Bacteroidetes (29), and Gammaproteobacteria (64). In order to confirm the results which were obtained on the marine Shewanella isolates, eight type strains of the genus Shewanella and one Alishewanella fetalis type strain were also investigated (see Additional file 1 for a complete list of strains tested). All marine isolates were screened with primers LuxS_degfor3 and LuxS_degrev4; for the Gammaproteobacteria, the primer set luxS_gamma_for and luxS_gamma_rev (Table 1) was also used. The luxS gene was not found in any of the Alphaproteobacteria and Bacteroidetes strains tested (Additional file 1), consistent with the survey of fully sequenced microbial genomes published previously [6, 7]. Conserved degenerate primers for the luxS and sahH gene. The luxS gene of Vibrio harveyi and the sahH gene of Rhodobacter sphaeroides served as the reference sequences for primer binding. In the Gammaproteobacteria, the fully sequenced genomes available through NCBI in January 2007 revealed that some representatives use the two step detoxification of SAH, hence contain the pfs gene and the luxS gene, while others use the one-step detoxification of SAH, thus harbour the sahH gene. There are several parasitic and also some free living species which have neither luxS nor sahH, but only the pfs gene. We screened 64 marine Gammaproteobacteria for the presence of the luxS gene (Additional file 1). It was found in all strains of Alteromonas, consistent with the full genome sequence of Alteromonas hydrophila. It was also found in seven of 13 strains of Halomonas tested; no complete genome sequence is available in this genus yet. In the genus Pseudoalteromonas, two genome sequences have been completed, i.e. P. haloplanktis and P. atlantica. Both species have neither a luxS nor a sahH homologue, but contain only the pfs gene. We tested 28 Pseudoalteromonas isolates, and found a PCR band of the expected size in 12 of them. In one strain the band could be confirmed by sequencing to represent a luxS gene fragment. Finally, the luxS gene was identified in the marine Shewanella (three strains) and Vibrio (three strains) isolates, as expected from the completed genomes in these genera. In order to determine if the luxS gene was consistently present in the Shewanellaceae family, nine type strains were investigated (including A. fetalis). In all of them the luxS gene could be amplified and verified by sequencing. The sahH gene is responsible for the S-adenosylhomocysteinase enzyme, which is able to detoxify SAH in one step without production of AI-2. In bacteria, usually either sahH or luxS is present as a single copy. All strains were tested with both sahH primers (Table 1). The sahH gene was identified in 66 out of 71 Alphaproteobacteria and in all 29 Bacteroidetes strains (Additional file 1), confirming that the strains from these phyla do not have the ability to produce AI-2 through the LuxS enzyme. Interestingly, the sahH gene was also found in some Gammaproteobacteria, namely in three strains of Psychrobacter sp. (HEL-6, HEL-32 and HEL-44). Two Psychrobacter species have been fully sequenced and also have the sahH gene (Additional file 1). Full genome sequences of representatives of two additional species of Gammaproteobacteria (Idiomarina loihiensis and Saccharophagus degradans) also revealed the presence of sahH (Additional file 1). In five of the 31 Alphaproteobacteria investigated, and in 27 of the 64 Gammaproteobacteria investigated, neither the luxS nor the sahH gene was detected. Available whole genome sequences of the phylogenetically closest organisms in the NCBI database were checked for comparison, since it can never be excluded that a negative result in PCR is caused by a primer mismatch. Within the Alphaproteobacteria, lack of both luxS and sahH has previously only been seen in the parasitic Ricksettia species , as well as in the genera Neoricksettia, Wolbachia, Anaplasma, and Ehrlichia . In the Gammaproteobacteria, the lack of both genes has previously been observed, and SAH recycling presumably occurs through the MTA/SAH nucleoidase alone . Ten of the 27 strains where neither luxS nor sahH could be identified belonged to the genera Glaciecola, Halomonas or Marinobacter, where genome sequences are not yet available. However, 17 strains belonged into the genus Pseudoalteromonas. The fully sequenced genomes of P. haloplanktis and P. atlantica also have neither luxS nor sahH, suggesting that this result might not be caused by primer mismatch but is actually correct and indicates SAH detoxification by the Pfs enzyme in these strains. However, confirmation of band identity proved difficult due to the simultaneous amplification of another gene of similar size. It can therefore not be excluded that more luxS genes might have been detected using different primers. Several of the Gammaproteobacteria species which did not have the luxS gene were tested for AI-2 activity using the V. harveyi bioassay. AI-2 could not be detected, confirming the PCR result (data not shown). All Shewanella and Alishewanella strains contained the luxS gene and were tested for AI-2 activity, which was detected in all of them. Table 2 shows the summary of all 73 bioassays conducted; for each species, the maximum A1-2 activity is averaged for the indicated number of bioassays. Average maximum fold induction values were between 4% (e.g. S. hafniensis, S. marinintestina) and 46% (S. japonica). Figure 1 shows a subset of these data; for each species, two different cultures are shown, each of which was tested in two different bioassays independently. 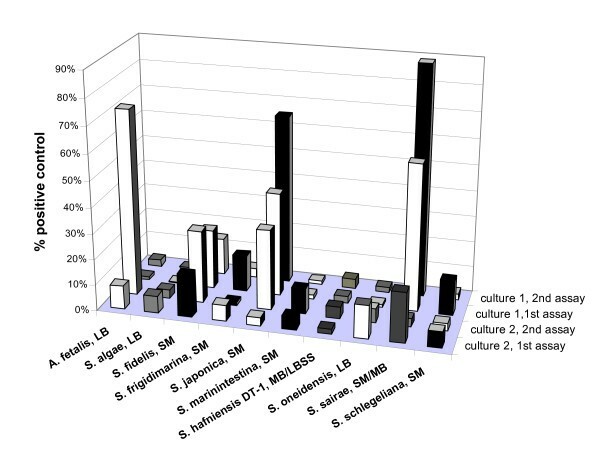 Variability between cultures and between replicate bioassays was sometimes very high. Independent of the level of AI-2 activity detected, the same growth phase dependent pattern of production was observed in all investigated strains. Fig. 2A shows this for two representative species, A. fetalis with low, and S. japonica with high maximum AI-2 activity. In all Shewanella strains AI-2 activity reached its maximum towards the end of the exponential growth phase and decreased during stationary phase. In species with high AI-2 activity, this decrease occurred gradually. By contrast, if the AI-2 activity was low, it disappeared rapidly at the beginning of the stationary phase within 2 – 4 hours. At the late stationary phase (after 24 h of growth), no AI-2 activity was detected in any of the strains tested. The same pattern was observed in all cultivation media used. As an example, Fig. 2B shows AI-2 production of S. hafniensis DT-1 in two different media. The strain produced similar AI-2 activities at the same growth phase in both of them. S. oneidensis was also cultivated anaerobically using iron as an electron acceptor (with 10 and 20 mM ferric citrate, respectively). Under these conditions, growth was very slow and AI-2 activity was not found (data not shown). Mean maximum AI-2 activity in Shewanella type strains and isolate DT-1. The peak of AI-2 activity (in % of positive controls) during one complete growth curve is averaged for the indicated number of bioassays. Mean ± standard deviation are given. Strain DT-1 was isolated from the surface of the diatom Thalassiosira sp. that was picked from a plankton sample (170 μm net) collected near the island of Helgoland in the North Sea on 4th April 2002 (depth 0.5 – 1.5 m). AI-2 production in different species of Shewanella. Peak of AI-2 production during growth in different species of Shewanella and Alishewanella determined by the V. harveyi bioassay. AI-2 production is indicated as percent of positive controls (synthetic DPD or culture supernatant from V. harveyi BB152). Conditioned media of the strains were collected from two different cultures throughout growth (culture 1 and culture 2), and tested in the bioassay two times (1st assay and 2nd assay). The filling pattern indicates the type of cultivation medium used: dots, SM medium; vertical bars, LB medium; diagonal bars, MB medium; grid, LBSS medium; S. Shewanella; A. Alishewanella. Effect of growth phase (A) and medium (B) on AI-2 production in representative species of the genus Shewanella. 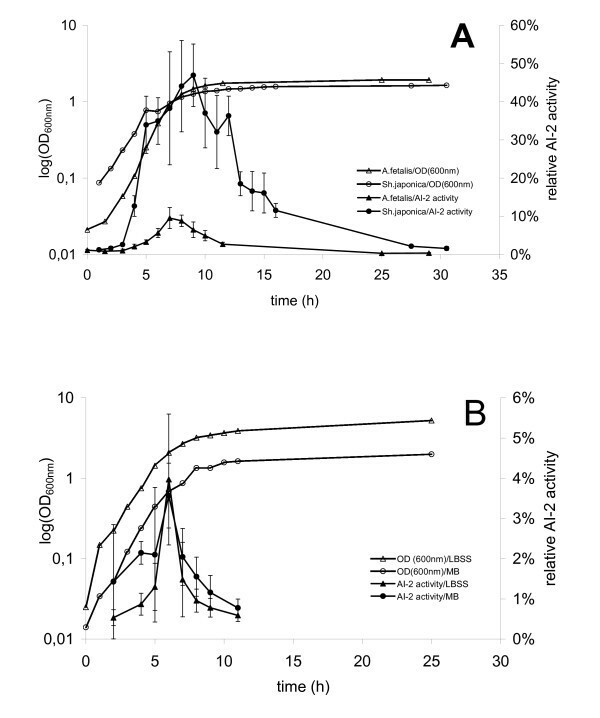 (A) Comparison between a Shewanella species with low (A. fetalis) and high (S. japonica) maximum AI-2 level. (B) AI-2 levels during growth for S. hafniensis DT-1 cultivated in marine broth (MB) and in Luria Bertani medium with sea salts (LBSS). Fold induction values are given as percentage of the positive control. Standard deviations are given for 4 replicate measurements of the same sample within a bioassay. In all Bacteroidetes isolates tested here, and in all fully sequenced Bacteroidetes strains, the SahH pathway was present, with the exception of Porphyromonas gingivalis, which uses the Pfs/LuxS pathway [20, 21]. This may indicate that horizontal gene transfer occurred in this species. The main habitat of this bacterium is the oral cavity, where many of the cultivated species use the Pfs/LuxS pathway [22, 23] and gene transfer might have a high probability. Several events of gene transfer have been demonstrated for the LuxS enzyme previously [7, 24]. A recent report demonstrated AI-2 activity in some Bacteroides isolates, although the luxS gene could not be identified . Isolates belonging into the Alphaproteobacteria had the sahH gene consistently and did not contain the luxS gene. Therefore, they use the one-step detoxification of SAH and do not have the potential for communication by AI-2. These results confirm previous work based on fully sequenced genomes [5, 7]. Within the Gammaproteobacteria, the luxS gene was found in all strains of the genera Alteromonas, Shewanella and Vibrio consistent with results from fully sequenced genomes in these genera. It was for the first time found in some strains of the genus Pseudoalteromonas. In this genus, whole genome sequencing and PCR amplification indicate that many representatives have neither the luxS nor the sahH gene and thus use only the Pfs enzyme for removal of SAH. The same is true for the genus Halomonas, where the luxS gene was found in some but not all representatives. Species from several other genera of fully sequenced Gammaproteobacteria (Marinobacter, Glaciecola, Colwellia) also contained neither the luxS nor the sahH gene. In addition, in the genus Psychrobacter (3 isolates) the sahH gene was found consistently, in accordance with fully sequenced genomes in this genus. The data strongly support the conclusion that the distribution of the luxS gene is dependent on the phylogenetic position of an organism rather than on the ecological niche which it has occupied, with rare exceptions which may have been caused by horizontal gene transfer. The complex pattern of presence/absence of luxS versus sahH in the Gammaproteobacteria requires a thorough analysis of the organismal phylogeny and possible gene transfer events in this group, which may not be monophyletic [26, 27]. The Shewanella type strains investigated here were isolated from the sediment of Lake Oneida (S. oneidensis) , the intestines of marine animals (S. marinintestina, S. sairae, S. schlegeliana), Antarctic sea ice (S. frigidimarina) , a human fetus (A. fetalis) , and marine seawater and mussel samples (S. japonica) . S. algae was isolated from red algae  and was differentiated from the first described member of the genus, S. putrefaciens, only later. S. hafniensis  was isolated from fish in the Baltic Sea, and is 98% similar to the marine isolate DT-1 obtained from the surface of a diatom . All Shewanella/Alishewanella strains were able to induce luminescence in the V. harveyi BB170 reporter strain, indicating that they produced the DPD derivative S-THMF which can be sensed by V. harveyi and which is usually referred to as AI-2. The large differences in the levels of AI-2 seen in the various species of Shewanella are partly due to the variability of the bioassay; however compounds inhibitory to V. harveyi might also be produced by some strains. For example, stationary phase culture supernatants of S. algae and S. oneidensis were able to inhibit V. harveyi luminescence (data not shown). Alternatively, the highly unstable DPD might be converted to compounds other than AI-2 in Shewanella, or the chemical equilibrium between S-THMF and R-THMF might be shifted towards the R-THMF molecule which cannot be detected by Vibrio. In all Shewanella strains, the pattern of AI-2 production during growth was the same. The amount of AI-2 detected in the culture supernatant had a maximum towards the end of the logarithmic growth phase. Subsequently, it decreased and disappeared completely in the late stationary phase. A similar pattern is observed in Salmonella typhimurium and Escherichia coli [4, 35]. In these bacteria, AI-2 triggers its own uptake through induction of an ABC transporter in the late logarithmic growth phase, followed by intracellular degradation. AI-2, or rather, R-THMF, is specifically sensed by Salmonella through the LsrR protein which bears remote resemblance to ribose transporters. In Salmonella and E. coli, there is little evidence of cell-cell communication through AI-2. However, nothing is known at the moment about the mechanism responsible for the disappearance of AI-2 from the culture supernatant in Shewanella species. A protein with weak homology (27% identity) to the LsrB protein is present in S. oneidensis, but most of the other genes in the lsr operon are missing. In this study, a phylogenetically and ecologically well characterized collection of 165 marine isolates was examined for their potential for communication by AI-2. For this aim, the presence of the luxS and sahH genes – representing the two pathways for SAH recycling – was determined by PCR with degenerate primers and sequencing. The majority of the isolates tested here belonged to phyla where whole genome sequence analysis had indicated the presence of the sahH gene rather than the luxS gene (Alphaproteobacteria, Bacteroidetes), and this was clearly confirmed in our work. Within the marine Gammaproteobacteria, the more complex picture which was already seen in earlier investigations [5–7] was confirmed in this study, with some strains harbouring the luxS gene, while the sahH gene was present in others, and many strains containing neither of those genes, raising questions regarding the evolution of the Gammaproteobacteria and of the Pfs/LuxS and SahH pathways, respectively. In the second part of our work, we focused on the genus Shewanella. The luxS gene was consistently found in all marine Shewanella isolates and all Shewanella type strains tested. The ability to induce luminescence in the V. harveyi reporter strain was demonstrated in 10 species of the genus Shewanella, both opportunistic pathogens and free living species. The kinetics of AI-2 production was very similar in all Shewanella species, showing a peak in the late logarithmic growth phase, and the disappearance of AI-2 from the culture medium during stationary phase. It will be the aim of future studies to elucidate the role of AI-2 in Shewanella. A total of 176 strains was investigated, of which 167 had been isolated from marine or hypersaline environments previously [11, 12] and 9 were type strains of the genera Shewanella and Alishewanella. The environmental strains were identified on the basis of near complete 16S rRNA gene sequences as described . A complete list of investigated strains and their phylogenetic affiliation is given in Additional file 1. V. harveyi BB152 ATCC® BAA1119™ and V. harveyi BB170 ATCC® BAA-1117™  were used for the bioassay to detect AI-2. V. harveyi BB170 carries a transposon insertion in the luxN gene, coding for the sensor for AI-1, and is therefore sensitive to AI-2 only. It is used as the sensor strain. V. harveyi BB152 carries a transposon insertion in the luxM gene responsible for AI-1 synthesis and thus produces AI-2, but not AI-1. Its culture supernatant was used as a positive control . Shewanella strains were cultivated under aerobic conditions at room temperature with shaking at 160 rpm in Erlenmeyer flasks, with the exception of S. oneidensis (30°C), A. fetalis and S. algae (37°C), and S. sairae (20°C). Media used were Luria broth (LB, Sigma), LBSS (LB with sea salts, composed of LB (Sigma) and 7 g/L sea salts (Sigma)), MB (marine broth, MB 2216, Difco) or SM (Shewanella Marine Medium) . SM medium contained 5 g bacto peptone, 1 g yeast extract, 1× salt solution (5× salt solution: 2.58 M NaCl, 0.125 M MgCl2, 0.125 M MgSO4, 0.1 M KCl) per litre. S. algae was also cultivated under anaerobic conditions without shaking at 30°C in LB medium supplemented with 20 mM Na-D,L-lactate (Fluka) and 10 mM or 20 mM ferric citrate (Sigma). Oxygen was removed from the medium by purging with N2. The bacterium was inoculated from an aerobic LB plate into anaerobic liquid medium (first transfer). After the third transfer growth was monitored and culture supernatants were collected for AI-2 determination. V. harveyi BB152 and V. harveyi BB170 were cultivated in modified autoinducer bioassay (AB) medium . The AB basic solution contained 0.3 M NaCl and 0.05 M MgSO4, and was autoclaved at 121°C for 20 min. After cooling down, the following components were added from sterile stocks: 20 ml casamino acids (10%), 20 ml glycerol (50%), 10 ml potassium phosphate buffer (1 M, pH = 7) and 10 ml L-arginine (0.1 M). Growth was monitored by measuring optical density (OD) at 600 nm in a Ultraspec Plus Spectrophotometer (Pharmacia). Degenerate primers were designed targeting highly conserved regions of the luxS and sahH gene, respectively, based on multiple alignments (ClustalW) of LuxS and SahH amino acid sequences. The alignment of the corresponding nucleic acid sequences was used to decide on a nucleotide in the primer sequence in case of degeneracy of the code. Since the luxS gene is only moderately conserved, the consensus-degenerate hybrid oligonucleotide primer design strategy (CoDeHOP)  was chosen for primers LuxS_degfor3 and LuxS_degrev4 (Table 1). According to this approach the primers are composed of two parts: a highly degenerate 5' end and a specific 3' end. The function of the degenerate 5'end is to bind to all possible templates in the first PCR cycles. Therefore, it targeted a region of 3–4 highly conserved amino acids, and covered all possible variations present in the nucleic acid sequence alignment. The role of the specific 3'end is to stabilize the binding of the primers in the later PCR cycles. Its sequence was identical to the most frequent nucleic acid sequence in the alignment and was about 20 bp long. At the time of primer design (July 2004) 24 complete luxS sequences of Gram negative bacteria were available. The luxS gene is about 500 bp long; and the primer pair LuxS_degfor3 and LuxS_degrev4 amplified ca. 400 bp (Table 1). In addition, a second, more specific, primer set was designed especially for the luxS gene in Gammaproteobacteria without using the CoDeHOP approach. The LuxS_gammafor1 primer targeted the same region as LuxS_degfor3. The LuxS_gammarev2 primer targeted the highly conserved mGC*TG*y region in the middle of the luxS gene. A fragment of about 250 bp was amplified with this primer set. The sahH gene is highly conserved and much longer than the luxS gene (about 1400 bp). Therefore, longer conserved amino acid sequences could be identified and it was not necessary to use the CoDeHOP strategy. 60 bacterial sahH sequences were used for the alignment and a universal primer set (SahH_degfor and SahH_degrev; see Table 1) was designed which worked from 40°C till 60°C and amplified about 470 bp. In some Alphaproteobacteria, these primers did not amplify the sahH gene. Therefore primers specific for this group were designed (Table 1). Primer SahH_alphafor targeted the AETEMPGL region that is completely identical in all sequenced sahH genes in Alphaproteobacteria. The primer SahH_alpharev targeted the G*G*VGKGS conserved region around the middle of the gene which is part of the NAD binding domain reported previously . This primer set amplified about 700 bp and was able to amplify sahH genes in additional Alphaproteobacteria at an annealing temperature of 60°C. DNA was isolated using the Nucleospin Tissue kit (Macherey & Nagel). The PCR primers are listed in Table 1. The PCR reaction mix contained: 1× PCR buffer (Qiagen); 3 mM MgCl2 (Qiagen); 1.25 U Taq polymerase (Qiagen); 1 μM forward and reverse primer each (Gibco); 200 μM dNTPs (Fermentas); 1 μl DNA and MilliQ water (Fluka) up to an end volume of 50 μl. The PCR protocol was as follows: Predenaturation at 94°C for 1 min, followed by 30 cycles of denaturation at 94°C for 10 sec, annealing for 30 sec at the temperatures given in Table 1, and elongation at 68°C for 40 sec (luxS gene) resp. 50 sec (sahH gene); finally postelongation was carried out at 68°C for 1 min 30 sec. The annealing temperatures listed in Table 1 were determined by PCR with a temperature gradient from 40 to 60°C. All of the PCRs were done in an Eppendorf Mastercycler. The PCR products were visualised on 1.5% agarose gels (agarose NEEO ultra-quality, Roth). Bands that were chosen for sequencing were excised from the gel and purified using the Qiagen Gel Extraction Kit. Excised bands were sequenced using the BigDye Terminator v3.1 Cycle Sequencing Kit on an ABI 3730 × l DNA analyser. AI-2 activity was always determined throughout the complete growth curve for at least 24 h. Samples were taken every 30 – 60 min until stationary phase was reached, then larger sampling intervals were used. Sterile culture supernatants were prepared from 1 ml of culture fluid by centrifugation (13.000 rpm, 2 min) and filtration (0.22 μm) and were stored at -20°C until use. The assay was conducted in white micro titre plates (Nunc) which were prepared before the assay by pipetting 20 μl of samples, reference and control in at least four replicas into the wells. Plates were stored at -20°C until use. DPD was synthesized as described . The concentration of DPD (M = 132 g/mol) was 0.7 mg/ml, e.g. ca. 5.3 mM. This solution was diluted 1:1000 in AB medium and served as a positive control. In some bioassays culture supernatant from V. harveyi BB152 served as a positive control. The assay described by Bassler  was slightly modified . Briefly, the sensor strain V. harveyi BB170 was inoculated from a freshly prepared AB plate with a well luminescent culture into 20 ml AB liquid medium in an Erlenmeyer flask with baffles and incubated (160 rpm, 30°C) until it reached an OD600nm = 1.0 and showed strong luminescence in the dark room. At this growth stage the sensor strain was diluted 1:5000 in fresh AB medium. 180 μl of the diluted culture were immediately added to the previously prepared, warmed-up micro titre plates with the samples. Plates were incubated at 30°C with shaking at 600 rpm on a Heidolph Titramax -1000 micro titre plate shaker and luminescence was measured every hour for up to 8 hours in a Wallac Victor 1420 Multilabel Counter (Perkin Elmer). AI-2 activity was calculated as the fold change between luminescence of the sample and luminescence of the reference. The reference for the positive control was AB medium, and the reference for the test samples was the growth medium in which the respective test strain had been cultivated. The percentage of AI-2 activity was calculated as the fold induction of test sample divided by that of the positive control. We thank Joel Klappenbach for kindly sending us S. oneidensis MR-1, and Dr. Satomi, National Institute of Fisheries Science, Japan, for the gift of S. schlegeliana, S. marinintestina, and S. sairae. AB performed most of the experiments, analysed the data, provided figures and tables and helped with writing the manuscript, BE did some experiments and analysed data, VT synthesized AI-2, SS improved the method for AI-2 synthesis, and IW-D designed the study and wrote the paper. All authors have read and approved the final version of the manuscript.